Most BGP speakers will be connected to more than one other speaker. This provides both greater efficiency in the form of more direct paths to different networks, and also redundancy to allow the internetwork to cope with either device or connection failures. It is possible (and in many cases, likely) for a BGP speaker to have neighbor relationships with other BGP speakers both within its own AS and outside its AS. A neighbor within the AS is called an internal peer, while a neighbor outside the AS is an external peer. BGP between internal peers is sometimes called Internal BGP (IBGP) while use of the protocol between external peers is External BGP (EBGP). The two are similar, but differ in certain areas, especially path attributes and route selection. You can see an example of BGP topology and the designation of internal and external peers in Figure 191. This diagram is a variation on Figure 171 that shows the names used by BGP to refer to different types of routers and autonomous systems. Internal routers are shown in blue while border routers are red. BGP speakers that communicate within an AS are internal peers, while those that communicate between ASes are external peers. 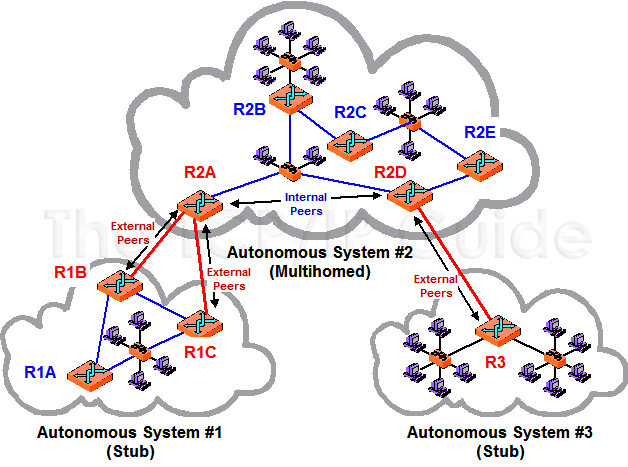 This highly simplified internetwork shows two stub ASes, both of which only connect to the multihomed AS #2. Key Concept: Each router configured to use BGP is called a BGP speaker; these devices exchange route information using the BGP messaging system. Routers that only connect to other routers in the same autonomous system are called internal routers, while those that connect to other ASes are border routers. Neighboring BGP speakers in the same AS are called internal peers, while those in different ASes are external peers. A peer connection between BGP speakers can be either a direct link using some form of layer two technology, or an indirect link using TCP. This allows the BGP speakers to establish BGP sessions and then exchange routing information, using the messaging system we will see later in this section. Of course, it also is the means by which actual end user traffic moves between autonomous systems. External peers are normally connected directly, while internal peers are often linked indirectly. In the next topic we will see that the method in which ASes are connected has an important impact on the overall function of the internetwork and how traffic is carried on it.